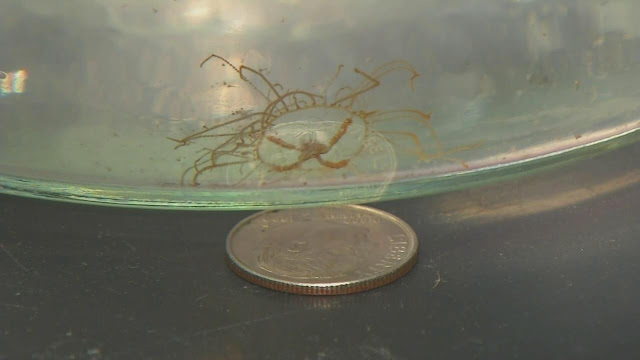 A small and stinging species of jellyfish has been found on Sweden's West coast, the Swedish Television SVT reported on Tuesday. The species is known as the clinging jellyfish, and it was last seen in Sweden 88 years ago. "It originates from the Pacific Ocean and was last seen in Sweden in 1930. It has also been found in Norway and Denmark, but never before has it managed to breed in Sweden," marine biologist Bjorn Kallstrom told SVT. The clinging jellyfish occasionally appears also on the American East Coast and usually, the coastguards warn about it at the seaside resorts. At the bay close to Gothenburg, where the jellyfish was found, there were a lot of them. Kallstrom says that the species is an invasive species in Sweden and that needs to be kept an eye on. The jellyfish is only approximately 2.5 centimetres in diameter and difficult to detect. Marine biologist Kallstrom guides people to stay clear of it. "I'm not sensitive to common stinging jellyfishes. But this little jellyfish burned me well. It really hurt," said Kallstrom. Earlier this year thousands of kilometres from home billions of jellyfish-like organisms called Velella velella washed up on French coast for the first time ever. Full story here. The increased numbers of the deadly creatures are believed to be linked to the prolonged spell of warm and settled weather, which has encouraged stingrays to move out of deeper water. Meanwhile, swimmers were warned after a 9ft blue shark was spotted close to the beach in St Ives, Cornwall. The largest blue shark caught in the UK was landed off Cornwall last July and then released. Research from the University of Southampton suggests new kinds of shark could migrate to UK waters as the oceans warm. Across the pond, two youngsters frolicking in the surf miles apart along the Fire Island National Seashore in New York suffered puncture wounds to their legs last month in an apparent shark attack that would mark the state's first such incidents in 70 years, authorities said. Meanwhile, Last month, monster-sized jellyfish swamped Northern Ireland beaches and Portuguese-man-of-war, thousands of miles from their normal habitat have been spotted around UK beaches.